It’s a fresh twist on classic comfort kind of day! 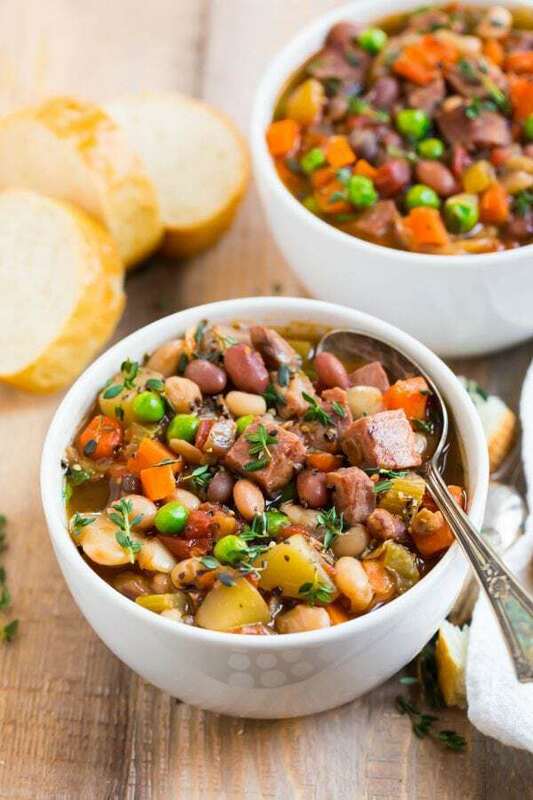 Slow Cooker Ham and Bean Soup. Whether you have leftover holiday ham in your future or are looking for a hearty, warming dinner that you can enjoy all week and freeze for later, this is the soup for you! When it comes to holiday menus, my family is happily and unapologetically stuck in our ways. On Easter, we have ham. And on the day after Easter—and the day after that and maybe the day after that depending upon how crazy my grammy goes when she selects the ham at the butcher shop—we have ham and bean soup. Today’s recipe for a healthy slow cooker ham and bean soup is stellar if you have leftover holiday ham (as is this Ham Sweet Potato Frittata), and if you don’t, it works fabulously with store-bought, ready-made ham too. This is outstanding news because thanks to this soup’s rich and lightly smoky flavor, creamy texture, hands-free crock pot cooking method, and—in case I haven’t convinced you yet—lineup of nutritious, healthy-dinner-worthy ingredients, you’ll want to make it far more often than once or twice a year. This recipe is flexible, so don’t be too stuck on specifics. First, let’s address the two primary ingredients: ham and beans. Ham. This could be a meaty ham bone you have left over after a holiday meal, or if you’d like to make it any old night (or if your ham runs out! ), you can swap 1 pound of cooked diced or shredded leftover ham. Cooked ham is sold already packaged at the grocery store, so look for it in the meat department. Beans. Dried beans are where it is at for this recipe! You do not need to soak the beans before using them in this recipe. This is actually one of my favorite things about it, because I never seem to remember the extra step of soaking my beans in advance overnight. Even the quick soaking method takes time. Another positive quality of this ham and bean soup recipe is that there is no “best” bean to use, in terms of the specific type of bean (navy, pinto, white, great northern, etc.). The important thing is that you choose 1 pound of dried beans. My favorite beans for ham and bean soup is in fact a bean soup mix, which is essentially a dried bean variety pack. I adore the assortment of sizes and subtle textures, and each kind of bean offers a slightly different nutritional profile too. This the exact bean soup mix I used (you’ll have some leftover). Goya also makes a popular mix (look for it by the Hispanic food if you don’t see it near the other dried beans), as does Hamms. If using Hamms, omit the seasoning packet, since this soup is already seasoned. For a crockpot white bean soup, opt for great northern beans or cannellini beans (which are sometimes referred to as white kidney beans due to their shape). Great northern beans are the larger of the two, but both will make your soup creamy, satisfying, and delicious. Only have pinto beans on hand? 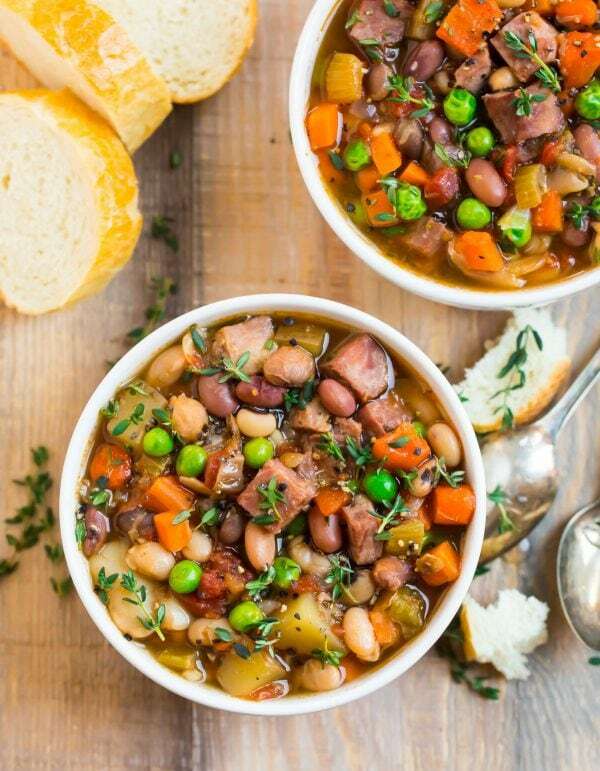 Go for a ham and pinto bean soup. 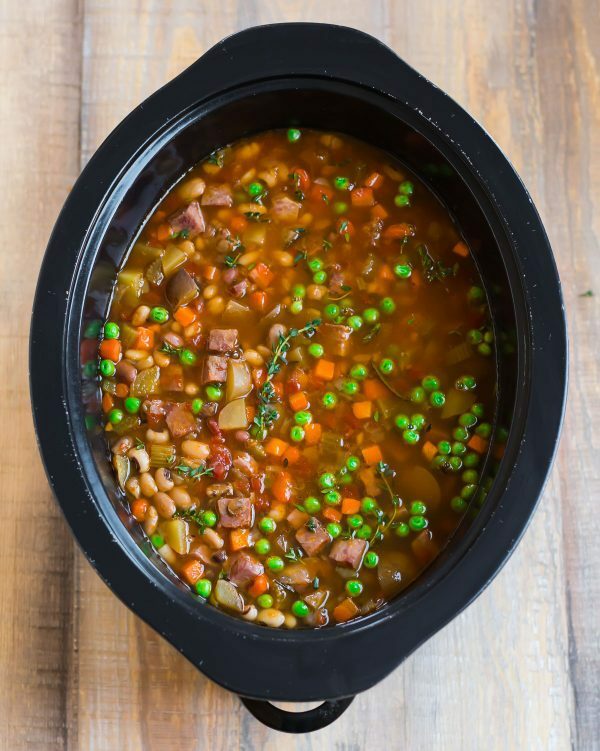 Prefer the classic idea of a slow cooker ham and navy bean soup? Yep! Those work too. The one direction I might not go is a ham and black bean soup, because black beans are *slightly* less creamy and their flavor is more pronounced than white, pinto, and navy beans. At the same time, I admit to 100% childhood bias (my family never used black beans in our ham and bean soup). Bias aside, the black beans’ flavor would be different, but if that’s all you have, your soup will still be scrumptious. Dried beans blow canned beans away. They’re creamy without being mushy, and the flavor tastes more genuine in a way that will make you feel like you are discovering what beans taste like for the first time. The slow cooker makes cooking the beans hands-free. The reason I don’t cook my beans from dried 100% of the time is that I don’t usually have time for the extra step. 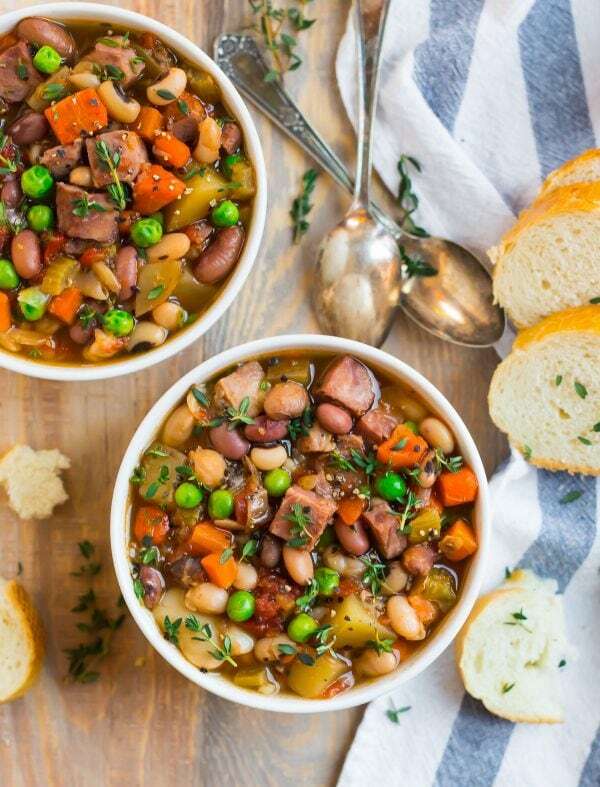 BUT, in the case of this slow cooker ham and bean soup, the beans cook in the crockpot right along with everything else, so you get max reward without any extra effort. WIN! The beans absorb the soup liquid as it cooks, which thickens the soup naturally. If you want to thicken your ham and bean soup further, you can simmer it uncovered on the stove or add a cornstarch slurry at the end, but I do not think that you will need it. I found myself adding additional broth to thin the soup out, it was that thick! Omit the water. Canned beans won’t absorb it the way dried beans do. Add three (15-ounce) cans of rinsed, drained beans of your choice (pinto, navy, great northern, etc.) or a mix. Cook on HIGH for 3 to 4 hours or LOW for 6 to 8 hours. To make this healthy Slow Cooker Ham and Bean Soup recipe healthy and a substantial all-in-one meal, I filled it with extra vegetables. Carrots and Celery. The soup classics. Peas. I always have a bag of peas in my freezer. They are ideal for adding extra color and veggies to almost any meal. You don’t even need to thaw them first; simply stir them in at the end. The soup’s heat will warm them almost immediately. Ham and bean soup can be bland on its own, and bland soup is not what we want. We want THE BEST ham and bean soup ever! For rich, complex, can’t-help-coming-back-for-more flavor, you need spices, herbs, and a hit of a surprising ingredient, acid. Fresh Herbs. Rosemary and/or thyme give the soup earthiness. Dried won’t taste the same, so it’s worth springing for fresh! Red Wine Vinegar. Just 1 tablespoon gives the soup surprising pop and balance. You won’t taste this ingredient specifically, but you will notice a clear, almost boggling boost in taste after you stir it in. We were more than pleased to eat this all on its own with a big hunk of the crusty sourdough that keeps popping into my grocery cart. For extra greens, it would be lovely with a simple green salad, like this arugula salad. 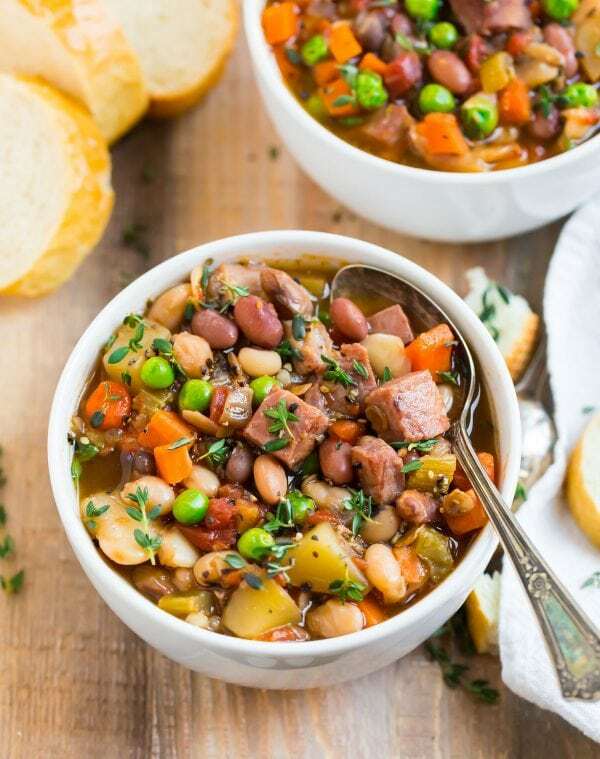 The BEST rich, hearty slow cooker ham and bean soup! Perfect for leftover holiday ham or use store bought ham to make it year-round. Easy and delicious! Rinse and drain the beans. Pick through and remove any unwanted bits of debris. Place in a 6-quart or larger slow cooker. In a skillet over medium heat, heat the olive oil. Once the oil is hot (but not yet smoking), add the onion, carrots, and celery. Cook, stirring often, until the vegetables are crisp-tender and the onion is turning translucent, about 6 minutes. Add the garlic and cook for 30 seconds, just until fragrant. Transfer to the slow cooker with the beans. To the slow cooker, add the ham bone (or diced or shredded ham), stock, 2 cups water, tomatoes, bay leaf, smoked paprika, chili powder, black pepper, and rosemary or thyme. Cook on high for 4 to 5 hours or low for 7 to 8 hours, or until the beans are tender. Once the soup is cooked, remove and discard the bay leaf and rosemary or thyme (the herb leaves will mostly have fallen off, so it will likely just be the stems left to remove, which is perfect). If using a hambone, remove it from the soup and shred or chop any meat left on it, then stir the meat back into the pot. Stir in the red wine vinegar and peas. If you like a thinner soup, add additional water until you reach your desired consistency. Taste the soup. Depending upon how salty your ham is, you may need to season it (or you may not need to add any salt at all). If the soup tastes flat, add kosher salt a pinch or two at a time until you are happy with the seasoning. It should taste flavorful and savory, but stop before it gets too salty (you can always sprinkle a little extra salt on your soup bowl if you are worried about oversalting the whole batch). Enjoy hot. Refrigerate leftovers for up to 4 days or freeze for up to 3 months. Let thaw overnight in the refrigerator. Reheat with a splash of water or chicken broth to thin the soup if it becomes too thick. For tips to make this soup with canned beans, see the blog post above.